What is Marichi's Pose D? Marichi's Pose D, or marichyasana D in Sanskrit, is the last of the marichyasana variations in Ashtanga yoga's primary series. It's very similar to Marichi's Pose C but even more challenging as the bottom leg is folded into half lotus. The pose improves circulation to the spine and boosts digestive power. Begin with the legs oustretched. 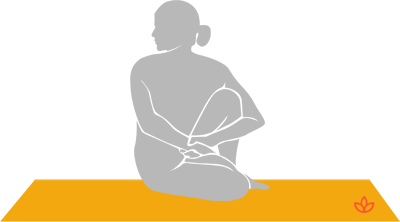 Bend the right leg and place it in half lotus. Bend the left leg and place the foot flat on the floor near the left buttocks. Exhale and twist to the left. Wrap the right arm around and behind the left leg. Reach the left arm behind and grab hold of the wrist.